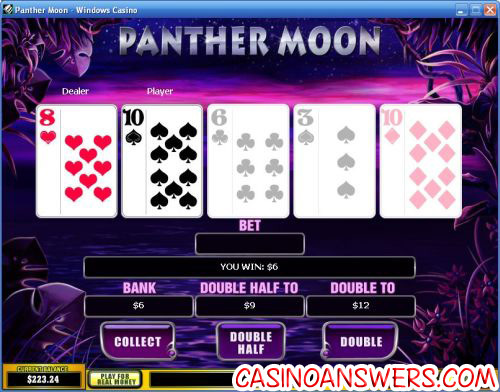 Panther Moon Video Slot Guide & Review - Casino Answers! Panther Moon is a 5-reel, 15-line video slot developed by Playtech, featuring scatter wins, wild substitutes, a free games feature with a multiplier and a gamble feature. You can play Panther Moon at Casino Del Rio and Europa Casino. 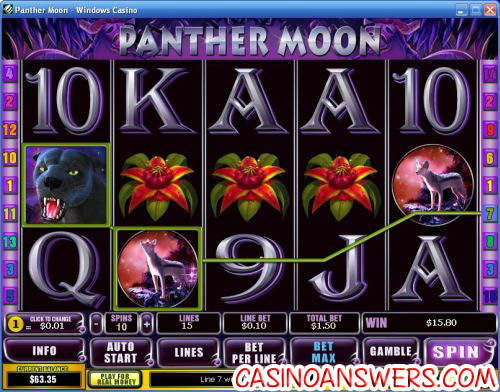 Panther Moon is a jungle themed video slot with some cool background music and sound effects. Its symbols include the Wild Panther symbol, Scattered Lake symbol, Wolf, Owl, Butterfly, flowers and Ace, King, Queen, Jack, Ten and Nine symbols. Many of these symbols are wonderfully animated, which you will see along with sound effects when they are part of a winning combination. The video slot has a dark look to it, with a lot of purple. It looks great, as most have come to expect from Playtech video slots. To start playing Panther Moon, set your coin value first. Coin values available are $0.01, $0.05, $0.10, $0.25, $0.50, $1, $2 and $5. Once you have chosen a coin value, you can now set your line bet. Your line bet is 1-10X your coin value (essentially 1-10 coins). Also, if you wish to change the number of active paylines, you can do that as well. We recommend leaving them at 15 as to not miss out on any winning combinations and decreasing your line bet or coin value instead. You can play the Panther Moon video slot for as little as penny if you’re a casual player or you can play up to the maximum bet of $750 per spin if you’re a high roller (or just insane). Once you’re ready to play, use the “Spin” button to play with your current settings or hit the “Bet Max” button to play the maximum bet per line and all 15 paylines. If you 5 Panther symbols appear on an active payline, you will win Panther Moon’s 10,000 coin top fixed jackpot. The Panther symbol is the wild symbol and will not only substitute for all other symbols (except scatter), but will double your winnings. If 3 or more Scattered Lake symbols appear anywhere on the reels, you will win 15 free games plus a 3X multiplier. This means that all of your winnings will be tripled during the free spins feature. More free games can be won infinitely during the free spins feature. In addition to the free spins feature, the Panther Moon slot also has a gamble feature. After any win, you can hit the “Gamble” button to either double your win (to win 2X) or double half your win (to win 1.5X). There will be five cars. The dealer will turn the card on the left face-up and you must choose which of the remaining four cards will be higher. You can win up to the double up limit, which depends on the casino you play at. For example, Windows Casino‘s double up limit is $750. Back out of the gamble feature at any time by hitting the “Collect” button. Only the highest win on a payline will be paid out. Winning combinations pay left to right only except for the scatter symbol, which pays any. Payline wins are multiplied by the line bet. Panther Moon has a basic autoplay mode. To play, type in the number of spins under “Spins” above the “Auto Start” button and then hit the button. You can also use the “+” and “-” buttons. You can cancel the autoplay mode at any time. Get a 100% up to $100 signup bonus to play Panther Moon and many other slots at Casino Del Rio – the world’s first eco-casino. After that, you will get 50% up to $50 reload bonuses for the next ten months. In addition to all of those excellent promos, for every new depositing player, Casino Del Rio will plant a tree! Are US players able to play the Panther Moon video slot? Unfortunately, the Playtech casinos that host Panther Moon are not taking deposits from players in the United States of America at this time. For many great video slots, please visit the US-friendly Bovada. Does the Panther Moon slot machine have a bonus game feature? Panther Moon’s special features include a free spins feature with a 3X multiplier and a gamble card game feature. In the gamble feature, you can double all of your winnings or double half of your winnings up to the gamble limit (varies depending on the online casino). Is there a panther slot machine?